Winnower: By this method using powerful fans the same effect is created that of the winnowing in the fields by which the foreign matters are removed from the leaves which enter into the stock at the collection and leaves picking stage. The pre-cleaned leaves along with stems of equal weight are also then fed into the graders. Grader: There are different graders which grades the leaves as per the size specified and by which method even pods are separated. The thick and thin stems are also separated. The leaves are fed again into the winnowers if required and completely pure leaves attained by removing even tiny stems as per customer's specification which are bagged or pressed as bales and stitched ready for export from our plant. Our existing processing unit processes and cleans various Seeds & Grains of Foodstuffs, Oilseeds, Spices & Herbals etc. Employing up to date technology, we are able to match international standards, with purity specification up to 99% and even up to 99.9% in some of the products. Pre - Cleaners: To remove dust, Stones, Twigs, Leaves and other larger impurities. De-Bearder: To remove / cutting of strings on some of the seed like Fennel, Cumin and Dill seed etc. Brush Separators: To remove impurities such as smaller stones, thread, husk, dodder and other residue. 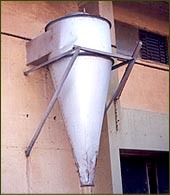 Gravity Separators: To remove stones, dead and other seeds by method of specific gravity separation before the final products are bagged and stitched. Indenting Cylinder : To remove broken pieces to maintain homogeneous quality. Apart from these there are cyclones and blowers which ensure even finer dust is removed from the product to give finer look and the total processing zone remain dust free by having dust collecting system at all input levels to ensure smooth working.These ensure that we maintain stringent quality control as well as efficient processing of large amounts. It helps us to cater to wide variety of product requirement. Our plant capacity is 12,000 metric tons annually. The process ends with final quality control before the goods finally leave our plant. For these international bodies like Society Generale de Surveillance in India (SGS) draws analysis samples and shipment is effected only after the Quality Certificate is issued. Containers are stuffed right in our plant to guarantee utmost quality check to our customers.